Over the years, many people have questioned my intelligence, most notably several past bosses. You need look no further for damning evidence to back up this charge than Exhibit A: I once ran a marathon. And not as a court-ordered punishment for littering. No, I did it voluntarily. A marathon is an absurdly long distance to travel without a car – 26 miles and 385 yards, to be exact. To put this into proper perspective, that’s twice the length of the island of Manhattan. It’s wider than the English Channel. And it’s 26 miles longer than I ever plan to travel on foot any time between now and when I die. I did some research and found that the word “Marathon” comes from the Greek mara meaning “sea” and thonus meaning “lacking in thought”, or, roughly translated “a sea of idiots. This makes complete sense when you realize that every year, tens of thousands of otherwise sane people pay good money for the opportunity to inflict pain and suffering on their bodies over 26 miles of concrete. 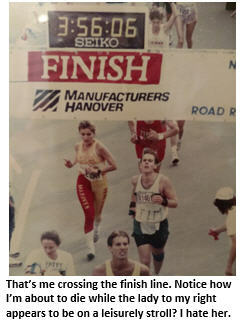 I ran my first (and last) marathon on Sunday, November 4, 1990. It was the granddaddy of them all: the New York Marathon, which winds through all five boroughs of the Big Apple. I was one of an elite few selected to participate. They shut the door after 25,000 registrants. It was a thrilling adventure, save for two teensy, weensy complicating factors: nasty hot weather and I was sick as a dog. Early November weather in New York is normally 53-ish degrees, perfect for long distance running. But that day the temperature spiked to a record-breaking 79 (25 degrees above normal), considered almost sauna-like for a marathon. And I was coughing up phlegm from a bad chest cold. In preparing, I had three ambitious goals: 1) Survive, 2) Don’t get mugged in the Bronx, and 3) Beat my wife. That’s right. I wasn’t the only half-wit in my family to take on this ridiculous challenge. My wife Michele thought “It sounds fun,” so she signed up, too. I had to beat her. When the starter gun sounded, there were so many runners crammed in the corral that it took me a full seven minutes just to reach the starting line. 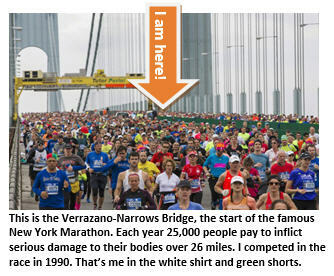 As I inched my way through the mosh pit of superior athletes, I noticed dozens of men were already making their first pit stop – right on the Verrazano-Narrows Bridge. Apparently, it made a convenient urinal into the water 200 feet below. Here’s a play-by-play of my race. The first ten miles are surprisingly smooth. But I eventually realize I’ve taken it out a little too fast. Could be a problem later on. Mile 13: My legs are starting to feel heavy. My breathing is labored. And I’m only halfway home. Danger, Will Robinson. Mile 15: I’m starting to fade. Still 11 miles to go. To distract my brain, I try to conjure up motivating upbeat songs. But the only tune that loops endlessly in my head is Muskrat Love by The Captain and Tennille. I become convinced there is no God. Mile 17: What was I thinking signing up for a marathon? I cry out to God that I will happily confess to kidnapping the Lindbergh baby if He will end this torture quicker. No response from on high. Oh, right – there is no God. Mile 19: Nothing left in the tank. Having difficulty concentrating. I can barely push one leg in front of the other. In training, I had never run farther than 18 miles, so my muscle memory is screaming at me, “Why in the Hell are we still running?” I make a mental note to run farther in training next time…. On second thought, delete note – there will be no next time. Mile 21: The crowds are thick now – several rows deep on both sides – all cheering for a guy in front of me named Charlie, because he had the brilliant idea of printing his name on both sides of his shirt. Another name flashes through my brain: Michele. Michele? Why does that name sound so familiar? Mile 25: My brain is blurry. I’m lost in a fog. People keep chanting for someone named Charlie. Is he famous? Am I Charlie? Bordering on collapse, somehow the noise of the crowd miraculously keeps me slogging forward. In the distance I see Central Park, where I vaguely recall is the finish line. I glance down at my feet. Incredibly, they’re still attached to my ankles. Dumb move. Now I can’t lift my head. Approaching the finish line: There it is. At last. Just 1,000 yards…1,000 yards … 1000 yards … 1000 yards. What’s happening? I keep lifting my feet, but it feels like I’m stuck on a treadmill, getting no closer. Everyone is passing me. I can feel the finish line mocking me. THE FINISH LINE! I did it. I dissolve in a puddle of exhaustion. 26 miles, 385 yards. I have survived this cruel ordeal. And I didn’t get mugged in the Bronx. Maybe there is a God after all. It is the greatest – and stupidest – achievement of my life. Believe it or not, my wife completes the race, too. 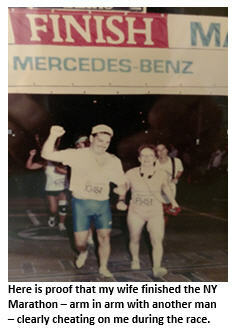 Oh sure, she walks the final 13 miles – reaching the finish line sometime before midnight. But she does it. So proud of her. My son-in-law loves doing marathons. He even did that mudder thing once. I like the finish line and cheering people on. I feel that’s my forte. LOL Congrats on this Tim!! I considered trying for a mini-marathon … thank you for talking me out of it. I can’t believe Michele cheated on you during the marathon and you didn’t leave her!! And soooo glad you caught her infidelity on camera. That was back before they had those “Beat a Cheater” shows! !